Over time, as I have commented before in this space, my favorite way of cooking seafood has become this: not cooking it. There is simply no better way to present seafood than in a manner that is as close to the sea as possible. The challenge in doing this is to develop flavor while maintaining simplicity; resisting the urge to do more. The best way, of course, is by combining absolutely superb products that bring out the best in each other. 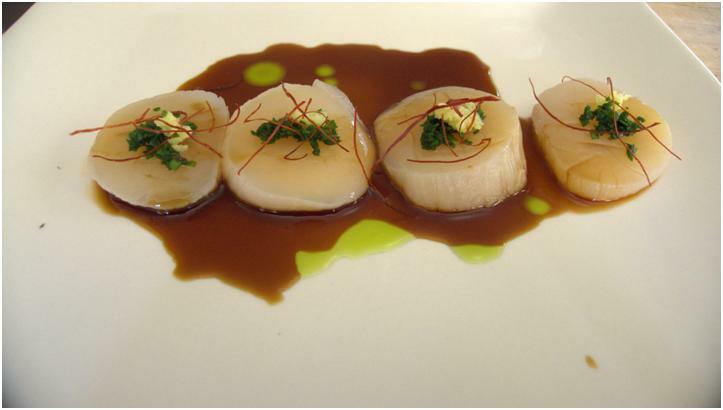 It goes without saying that serving raw scallops means serving scallops that are brilliantly fresh. This is no time to break out those white supermarket hockey pucks. And average soy sauce will not do. This is no time for the stuff out of the packets…or that ubiquitous Kikkoman bottle. And while there is nothing wrong with fresh lemon juice (and a lot right about it), there is something mysterious and profound about yuzu juice that elevates this dish far beyond your ordinary sashimi. Make the Chive Oil. Trim the chives back to the leafy part. Run the chives under very hot water for 20 seconds and then pat dry. Place the chives in the bowl of a food processor process while drizzling the grapeseed oil in very slowly. Transfer the resulting oil to a bowl and refrigerate for at least an hour (overnight is preferable). Strain the solids from the oil using a very fine mesh strainer. Prep the Vegetables. Finely mince the leafy part of the chives. Peel and trim the ginger and grate or finely mince it. Assemble the Dish. Cut the scallops in half, width wise leaving yourself with 4 to 6 identical discs. Place four scallop discs on each plate. Spoon two tablespoons of the soy sauce over the scallops. Spoon a teaspoon of the yuzu juice over the scallops. Top each with a pinch of the minced chives and of the grated ginger. Arrange some ginger threads on each. Garnish with the chive oil. I love the use of less common ingredients in this recipe. It sounds like a memorable dish.